The artichoke may not be the most attractive-looking vegetable, but the green leaves may be the answer to your weight problem! The artichoke has impressive diuretic and fat burning properties that will help you shed the pounds without putting in that much effort! One of the major health dangers associated with dieting is failing to give your body the essential nutrients that it needs. This can lead to many deficiencies and you simply start to feel (and look) ill. Before you know it you have given up your diet and you are piling the pounds back on. The key to real and sustained weight loss is a balanced diet. This will ensure that you get all the nutrients that you need. Artichokes are an excellent addition to that diet as they deliver B vitamins, iron, magnesium, amino acids, flavonoids, phosphorus, and potassium. Artichokes are a valuable weight loss tool but they are not a magic potion. There is no such thing as a vegetable (or slimming product) that will cause you to lose weight in a small amount of time. There are foods that can help facilitate this process but only if you have willpower to stick to a healthy diet and change your lifestyle long term. The artichoke is an ancient vegetable with special properties – it delivers carbohydrate that metabolises slowly in the body, which is great for diabetics. Artichokes are rich in fibre so they help to lower blood glucose levels and control cholesterol levels. This also helps to prevent constipation. Artichokes contain cynarine – an amazing substance that helps stimulate bile secretion, which promotes fat digestion as well as a diuretic effect which prevents fluid retention. Artichokes contain less than 1% fat. Therefore, they have a very low calorie count (22 calories for every 100 grams). The artichoke makes a contribution to your diet because of its calorie level, its diuretic effect, and its ability to process fats, so that they can be easily eliminated. They are thought to boost liver function – by cleansing and regenerating. They help with digestion and fat elimination. They can act as a good detoxifier – they cleanse your intestines, liver, and kidneys. They may lower you blood cholesterol level. They have diuretic and depurative properties – perfect for healthy kidney function. 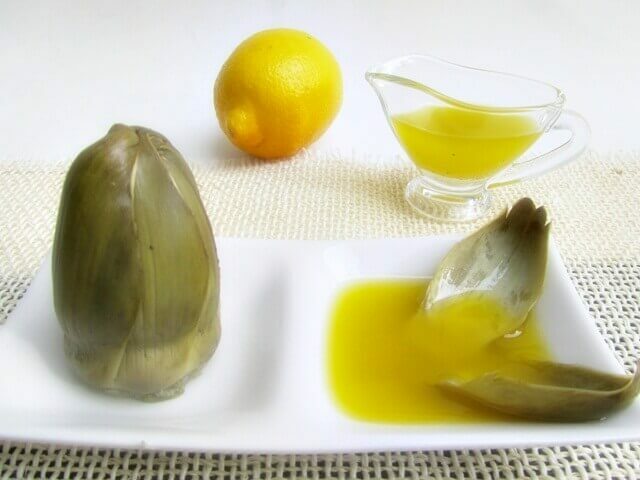 Artichokes can help you defend yourself from coronary diseases like artherosclerosis. The artichoke diet requires you to drink artichoke water three times a day. Do this for 10 days a month for at least 3 months. As a result, you will not only lose weight, but also detox your body. For the ten days, base your diet on natural juices, fruits and vegetables but consume few bad fats or processed foods. It is also best to do at least half an hour of exercise a day. Take two medium-sized artichokes that are very fresh, dark skinned, and healthy looking. Wash them well and cut the stem end off. Put a litre and a half of water in a pot. Boil the two artichokes until they have a good tone and become softer. You can use them to make a meal. Collect the water in which the artichokes boiled. You will have around a litre and a half of water. Drink this throughout the day. You can start at breakfast: Eat a cup of oatmeal with an apple and drink a glass of artichoke water. You can also drink it after your main meals. Remember that it boosts your digestion, that it is a diuretic and helps you process fat. That is why it works so well with meals. You can drink the litre and a half throughout the whole day. You can put it in the fridge and when you drink it, you can add a little lemon juice or mint leaves.